Earnings Per Share – In terms of earnings per share, GES did incredibly well. During the second quarter, analysts expected that the company would produce earnings in the amount of $0.07 per share. However, the company shattered these expectations reporting earnings of $0.14 per share in the second quarter. Revenue – In terms of revenue, GES slightly missed the mark. During the quarter, analysts expected that the company would generate revenue in the amount of $550.53 million. However, the company actually reported revenue in the amount of $545.0 million. This figure not only fell short of analyst expectations, it shows a slight year over year decline from $546.3 million. Same Store Sales – When it comes to same store sales, Guess? did relatively well. During the second quarter, analysts expected that we would see same store sales declines in the amount of 4.3%. However, the company reported that same store sales fell just 2% in the quarter. Guidance – Finally, guidance proved to be relatively positive. During the current quarter, the company is expecting to generate earnings between $0.11 per share and $0.16 per share. This comes right in line with analyst expectations. For the full year, the company said that it expects earnings to come in between $0.62 and $0.75 per share. This figure came in ahead of analyst expectations of $0.60 per share. One of the first things that investors learn when they get started in the market is that it’s important to watch the news. After all, when positive news is released with regard to a publicly traded company, we can expect to see gains. Adversely, negative news will generally lead to declines. In this particular case, the news was overwhelmingly positive. 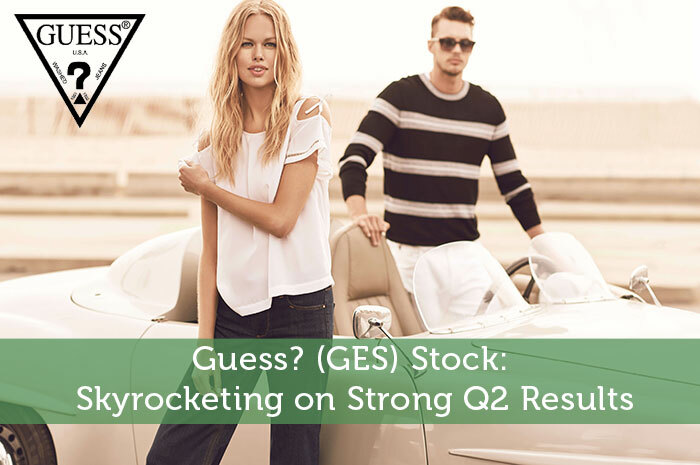 Not only did GES blow away expectations with regard to earnings, guidance and same store sales proved to be positive as well. As a result, we’re seeing gains in the value of the stock today. Currently (2:39), Guess? stock is trading at $18.16 per share after a gain of $3.26 per share or 21.88% thus far today. Moving forward, I have an overwhelmingly bullish opinion of what we can expect to see from GES. While the stock may correct, coming down off of today’s highs, in the long run, things are looking great. Sales are sustaining and profits are up. What more can we ask for? Where do you think GES is headed moving forward? Join the discussion in the comments below!